Board Culture is a true community surf store that’s utterly dedicated to making all kinds of water equipments both hard and inflated ones. Their authentic boards are top notch with amazing designs and quality and that touches the making of their inflated boards directly. In other words; having enough experience with making hard SUP boards offers a better and wider view on how things work and should be. In this review today, we’ll be covering the Stradbroke iSUP by Board Culture to depict its most prominent features and design details in an attempt to bring you closer to what you have in mind. The Stradbroke is an all-round iSUP that’s meant for recreation, touring and that’s also good for beginners. It’s 10 feet and 4 inches long, 33 inches wide and 6 inches thick. This board can handle up to 300 lbs for maximum weight capacity, and that could be translated to a fully grown adult plus cargo. It’s a roomy iSUP especially for petite to medium riders, while we can all agree that a large individual might appreciate a longer board. In terms of width, the Stradbroke is definitely a winner. 33 is by far the best number you can get on any all-round iSUP. Thus, a beginner or a yoga enthusiast is going to love the balance offered here. What’s even better is that the 6 inches thickness adds up to the board’s whole performance by making it sturdier, safer and more stable. You can reach maximum weight capacity and you’d still be effortlessly floating on the water’s surface. The Australian brand stands behind their Stradbroke with a 3-year warranty that’ll keep you covered under different circumstances. This comes from the fact that this board is made of Strongest PVC Military Grade Material that’s if anything is wide-worldly known for being virtually indestructible. It only takes pumping to witness the creation of rigidity right in front of your eyes. The drop stitch core is also something to appreciate here; it makes it possible for the board to be fully inflated over and over again, and every time it’ll be as hard and stiff. The drop stitch fibers work to hold the board’s parts together and that will preserve the board’s shape and firmness for years to come. 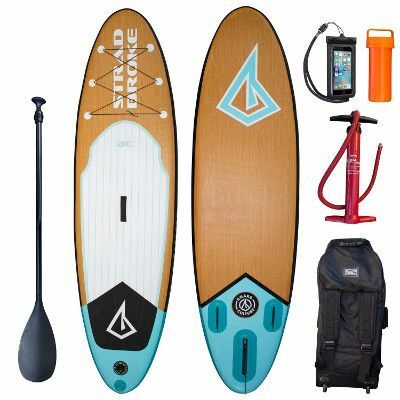 Now the thing about these materials and technology used to build the Stradbroke is that as a board it’ll strike you how light it is; the smallest of riders will be able to easily carry it around without any struggle whether it was inflated or not and that’s one of the best things about inflatable stand up paddle boarding. We usually like to start with what’s most obvious to the eyes, and that should be the bamboo wood realistic design that’s quite appealing and authentic. The traction pad is a white and black one with soft blue strips on the white side and the Board Culture’s logo on the black one. It’s grippy and thick to ensure both; comfort and durability. Also, there’s a cargo area on the front deck with 6 D-rings and a bungee cord connecting them. This feature is the most iconic about any iSUP and it comes super handy when you need to secure any items or equipment to the board. Next; you’ll find an additional D-ring on the board’s tail for beginners and safety seekers to attach an ankle leash. Another iconic feature is definitely the central carry handle, it’s rigid and functional and it comes extremely useful when in need to transport the inflated board. 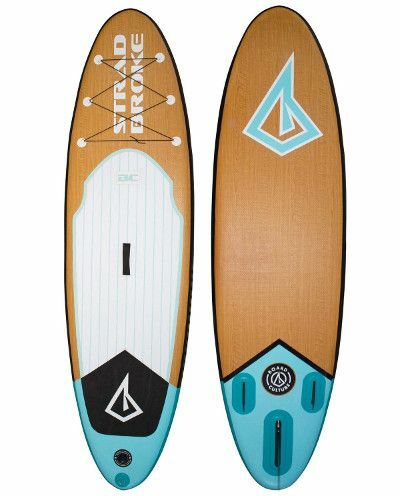 Last but not least, the Stradbroke comes with a trio-fin navigation system which is very common for board’s its size. The central fin is large and removable like usual while the remaining two are smaller and fixed. 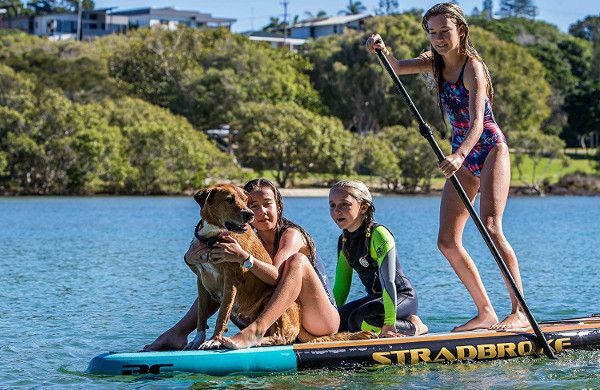 Board Culture did a really nice job with the Stradbroke iSUP; after plenty of tests and experiments, this board proved to be a highly versatile one with the ability to perform different tasks and water activities all very efficiently. Let’s start with balance; the Stradbroke could be a great yoga iSUP given the fact that’s 33 inches wide. You’ll easily find your way to controlling your body and posture in no time regardless of your skill level. Also, the navigation system adds up greatly to the whole control aspect making the board a lot more responsive with nice straight tracking and a smooth glide. A quality wheeled backpack for easy packing and transporting. A 3-piece adjustable paddle to suit all different riders’ height. A Bravo dual action hand pump. And a water resistant phone-cover. The Stradbroke is a durable and stable iSUP (33 inches wide). It’s great for beginners, yoga, recreational paddling and surfing. The package includes a quality wheeled backpack. You’ll get a 3-year warranty. We wished the Stradbroke came in different colors and designs because not everyone is into woody prints.